I began riding dirt bikes at the age 12 on an RM125. My father had a hard and fast rule: I was not allowed to ride a street bike until I turned 18. A month shy of my 18th birthday I bought myself a street bike, a KZ550LTD, much to my father’s disapproval. On the verge of being kicked out, I was able to smooth things over enough to get through the next month. I kept my room and the bike, but I was not allowed to ride it. The month-long wait to ride was excruciating (even though I managed to sneak in a few rides without his knowledge!). I have been riding ever since and have never looked back. 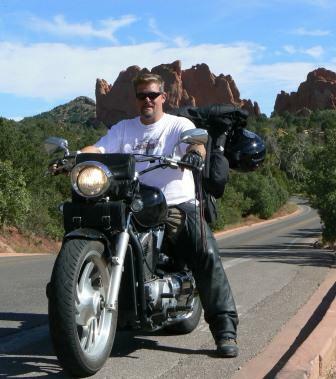 I currently live in Arizona and own a 2006 Honda VTX1300C. I began doing LDR’s in the summer of 2009. One of my most memorable moments occurred while on an LDR from Tempe (AZ) to Boise (ID). My route from Lake Powell (AZ) to Kanab (southern UT) was a crystal clear night that proved to be very cold. By 1 a.m. I was extremely tired. As I turned west, the full moon setting over the horizon filled my entire vision. There was no roof, no door jamb, or no rear view mirror to obstruct my view. For the next hour, the chill of the night air with its subtle but definite temperature changes enveloped me as the terrain rolled past. The solitary sound of my engine was accompanied by the fragrant aromas of juniper, cedar and sagebrush mixed with the occasional stench of decaying roadside remains. I was the only one around for miles, and I felt as if the road were truly mine. I hope that my love affair with two wheels and the open road never fades. Next summer I would like to ride in Colorado. I want to take a week and cross the Continental Divide as many times as possible.